A newspaper article about the upcoming performance of the Southern Ballet Theatre's (SBT) comedy ballet titled Coppélia. 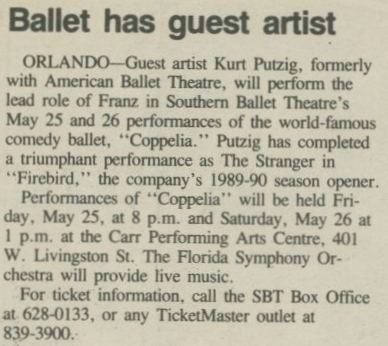 According to the article, Kurt Putzig, formerly of the American Ballet Theatre, was slated to play Franz in on May 25 and 26, 1990. The ballet was to be held at the Bob Carr Performing Arts Centre, located at 401 West Livingston Street in Orlando, Florida, and the Florida Symphony Orchestra was to provide live music for the performance. Original newspaper article: "Ballet Has Guest Artist," May 1990: Private Collection of Beatrice Gestrich. 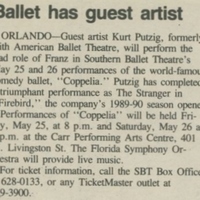 Digital reproduction of original newspaper article: "Ballet Has Guest Artist," May 1990. “Ballet Has Guest Artist.” RICHES of Central Florida accessed April 24, 2019, https://richesmi.cah.ucf.edu/omeka/items/show/5794.